Chapter 13 Bankruptcy Judge Denies Fees: What Was The Basis? You are here: Home / Chapter 7 Bankruptcy / Chapter 13 Bankruptcy Judge Denies Fees: What Was The Basis? In a recent chapter 13 bankruptcy filing, a debtor was attempting to recover his towed and impounded vehicle. The vehicle was impounded due to unpaid parking tickets owed to a village. The tow company towed the vehicle and was unwilling to release the vehicle back to the debtor. The tow company would not provide simple information such as their fax number, their local counsel or even a timeframe as to when the vehicle would be released. In fact, the tow company went so far as to say that they will only release the vehicle when they are paid. Such conduct clearly violates the Bankruptcy Code, the Thompson decision, and the spirit of chapter 13 bankruptcy which gives honest debtors an opportunity to reorganize their debts over time. The seventh circuit case entitled Thompson states that a finance company or other person in control of the debtor’s vehicle must release said vehicle upon receiving notice of the bankruptcy filing. In this case, the tow company was adamant and would not release the vehicle. The only way to force the hand of the tow company was to file a motion for sanctions before the court in an effort to hold the tow company financially responsible and liable for damages to the debtor and for attorney’s fees to debtor’s counsel. After several court appearances, the matter finally came before the judge for damages based on a default judgment. Judge Baer awarded the debtor $500 in damages, but denied attorney’s fees that were sought against the tow company for the violation of the automatic stay, violation of the Thompson decision and for the undue burden that the tow company put on the debtor’s counsel in an effort to obtain the clients car. The judge believed that the services provided by debtor’s counsel were covered under the court approved model retention agreement. Unfortunately, the judge was not asked to point to the specific section of that agreement as to how it relates to this issue. In fact, if you examine the model retention agreement effective as of April 20, 2015, the agreement mandates what the debtor will do and what debtor’s counsel will do both before the case is filed and after the case is filed. Keep in mind that this is an agreement between the debtor and his attorney. This agreement does not involve a third party whatsoever. In any event, there are 16 items that state what the attorney is to do after the case is filed. 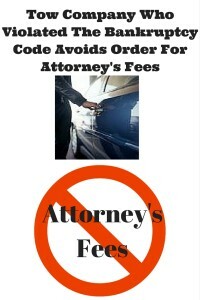 These include among other things, appearing at the meeting of creditors, providing knowledgeable legal representation, submitting timely documents to a chapter 13 trustee, timely preparing and filing statements, amended schedules and other documents, objecting to improper or invalid claims, timely responding to motions to modify the automatic stay and providing other legal services necessary for the administration of the case. None of these itemized examples pertain to the specific situation at hand. In this particular case, debtors counsel is seeking attorney’s fees as a sanction against the tow company who violated the law. This has nothing to do with the model retention agreement executed between the debtor and debtor’s counsel. In fact, this should be treated no different than a chapter 7 bankruptcy case where debtor’s counsel seeks sanctions for violating the automatic stay. That is exactly what we have in this particular case. Perhaps the court mistakenly believed that attorney’s fees were being sought against the debtor which would be paid through the plan in addition to the model retention agreement amount. However, I feel that the judge clearly did not want to award fees and relied on the court approved retention agreement as the basis to do so. As I’ve highlighted and illustrated above, this is a false argument that has nothing to do whatsoever with a third-party tow company who violates the law. I do not see why the court was not offended by the tow company and its unwillingness to return debtor’s property. The tow company violated the automatic stay, it did not adhere to the tenants of the Thompson decision and it didn’t even respond in writing to the motion for sanctions. Based on all that occurred in this case, it appears that a huge injustice was done in that no fees were awarded as a sanction against the towing company. Let’s hope the next time this issue comes before the court, the court will be held to answer as to how and where this service is contemplated by the court approved retention agreement. It simply doesn’t exist in the agreement. The agreement is only between debtor’s counsel and the debtor. When a third-party violates the law and violates the automatic stay, it should be held accountable not only to the debtor but to debtor’s counsel for their fees. This has a long-standing history in chapter 7 cases and it should apply equally in chapter 13 cases despite the court approved retention agreement.